Your Passion is Sports, Our Passion is You. The elbow is a hinge joint made up of 3 bones – humerus, radius and ulna. The bones are held together by ligaments to provide stability to the joint. Muscles and tendons move the bones around each other and help in performing various activities. 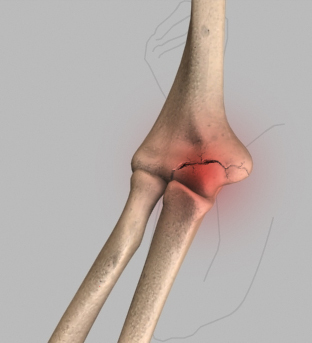 What are the Common Causes of Elbow Pain? Elbow dislocation: Elbow dislocation occurs when the bones that make up the joint are forced out of alignment. Elbow dislocations usually occur when a person falls onto an outstretched hand. Elbow dislocations can also occur from any traumatic injury such as motor vehicle accidents. When the elbow is dislocated you may have severe pain, swelling, and lack of ability to bend your arm. Sometimes you cannot feel your hand, or may have no pulse in your wrist because arteries and nerves run along your elbow may be injured. Elbow fractures: Fracture is a common injury to the elbow. Elbow fractures may result from a fall onto an outstretched wrist, a direct impact to the elbow or a twisting injury. Elbow fractures may cause severe pain, swelling, tenderness and painful movements. If a fracture is suspected, immediate intervention by your doctor is necessary. Surgery is often required if a bony displacement is observed. Tennis elbow/golfer's elbow : Tennis elbow is the inflammation of muscles on the outside of the elbow whereas tendinitis on the inner side of the elbow is golfer's elbow. Overuse of the arms or a traumatic blow to the hand may cause tennis elbow or golfer's elbow. These injuries may cause severe pain and tenderness of the affected muscles that radiate down into the forearm, particularly with use of the hand and wrist. Adequate rest and immobility of the affected part helps the muscles to recover and modification of the activities helps in better healing. Heat therapy, followed by a stretching and strengthening exercises and then ice massage may offer be beneficial. A tennis elbow strap may relieve the pressure from the muscle attachment. Pain medications may be recommended to relieve the pain and inflammation. Tendonitis: Tendonitis is inflammation of any of the tendons in the wrist. Tendonitis is usually treated with adequate rest, splinting, ice application, and with non-steroidal anti-inflammatory medicines to reduce the inflammation. Hook of the hamate fracture : Fracture of the hook of the hamate bone, one of the small bones of the wrist, is another injury common in golfers. The hook of the hamete bone protrudes toward the palm, and is susceptible to injury from the club on a hard hit to the ground as the handle crosses right over the bony hook during gripping the club. A splint or cast may be used if the fracture is seen soon after the injury. If there is continued pain, surgery is usually performed to remove the broken bone fragment. Any problem causing pain, swelling, discoloration, numbness or a tingling sensation, or abnormal position of the hand, wrist, or elbow that persists for more than two or three days should be evaluated by your doctor to establish the cause and obtain the best treatment as early as possible.